22-year-old Hardik Patel, who has been leading the Patel agitation in Gujarat to demand an OBC quota for the community, said that he will start meeting the MLA's of Patel community from 4 September. "We will start meeting Patel MLAs from tomorrow and ask them to clarify their stand on whether they are with Patels on the issue of inclusion of community in OBC category or with their respective parties," Hardik, the convener of Patidar Anamat Andolan Samiti, told reporters. Hardik was here to attend a condolence meeting of 32-year-old Swetang Patel, who allegedly died in police custody in Bapunagar area of the city. "We will start meeting MLAs of Ahmedabad. I myself along with hundreds of my supporters will meet those MLAs and will give them a rose," he said, adding that the entire meeting will be videographed. There are more than 35 Patel MLAs in the 182-member Gujarat Assembly. Hardik also gave Rs one lakh cheque to Swetang's mother Prabhaben Patel. The 22-year-old fiery Patel leader said he had earlier donated Rs one lakh to Swetang's family and today he gave another Rs one lakh to the bereaved family. He said his community members will come forward to contribute to the families who lost their kin and also to the persons who sustained injuries in "police atrocity". On a question if he is satisfied with the probe of the alleged custodial death, he said, "We say Jai Jawan and in this case, we have to believe in our jawans. We are hopeful probe would be taken to right directions." Swetang was allegedly killed in police custody on August 26. The Gujarat High Court had ordered CID probe in the case after a plea was filed by his mother. Meanwhile, Gujarat Pradesh Congress Committee Bharatsinh Solanki along with other senior party leaders Arjun Modhwadia and Siddharth Patel also attended the condolence meeting. 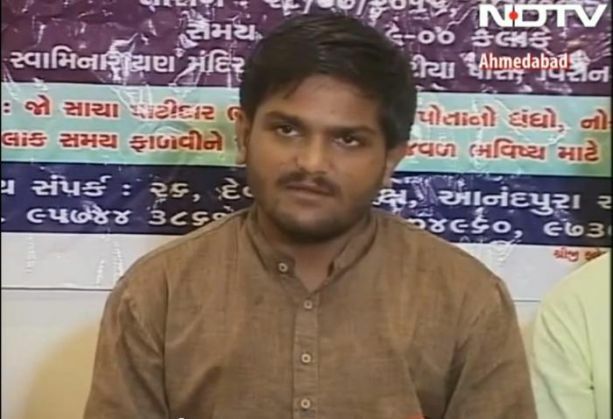 Talking to reporters, Siddharth Patel blamed the BJP-led state government behind the widespread violence in Gujarat when Hardik was detained briefly after a rally on 25 August. He alleged that the state government has given a free hand to the police which triggered the violence. When asked if the Congress will support Hardik's demand for reservation, he said, "Congress has already clarified its stand on the issue."